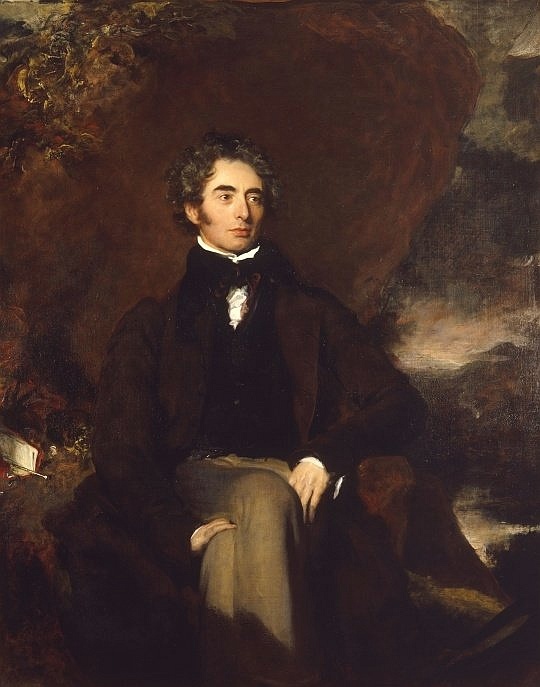 Robert Southey with his book. Believe it or not, he was considered a good looker in his time,. Here is Robert Southey's "His Books." Now Southey was a member of the Lake School of Poets of the Romantic era, though all 3 members were different from each other. Though, to be sure, Charlotte Brontë wrote that Southey's nature poems were good and true. Wordsworth was The Nature Poet, which means southey must have had a similar muse. But what he is famed for is different. It was historical epics involving different cultures he wrote, long narrative poems such as Thalaba the Destroyer and Madoc - which seems in touch with the exotic Gothicism of that era. He made more money than Wordsworth or Coleridge, too, mainly from reviews and historical books, and his poetry seems to have been more popular than theirs when they were young. But he has not lasted so well. I haven't read Southey (partly because there is no anthology of his works easily available I can browse through, and no short lyric he is famous for). But I stumbled on this in Bartleby, which has many interesting literary works online for free. "His Books" seems to illustrate Southey's own personal thoughts well. It is told from the perspective of a scholar. "My days among the dead are past," seems to imply that the scholar thinks he is good as dead. Alternately, it might mean that his predilection for the dead (history that is) is gone. Indeed the following lines confirm that he worships the "mighty minds of old," and Southey was a historian and biographer. It seems almost melancholy and pathetic that he resorts to talking with the dead by books, instead of seeing life as it is. Southey once said his poetry has to do with the history he reads, rather than from life and nature, unlike Wordsworth who was into nature and rural villagers. He seeks solace in books rather than people. Southey was a shy person, perhaps this refers to a shy scholar? He lives in history - he understands their virtues and faults, and feels for them - almost as if he were part of that era rather than the present he lives in. But there's also another side to it - his hopes are with the dead - he wants to be part of them. No, not because he wants to die, but he hopes to live forever in history, and therefore gain immortality. The history we read is in a sense immortal - because only important events get written down (usually) while the petty figures disappear with time. Now this relates to Southey himself. He said that Wordsworth's works were immortal and would last, whereas his would not. This prophecy turned out to be true, and he feared that he would not be remembered. With his predilection for history, he worships dead things - and often this obsession with history does not guarantee universal immortality. Because to write a great work you often have to be in touch with your time (I know, there are exceptions, but many enduring historical novels are set only a few decades ago). This is because reading up history you are too preoccupied with the facts to concentrate on universal human passions. With the distance of time you cannot imagine how people thought, felt and acted. In your own time you have a vivider idea, which is why many historical novels tend to be dry and flat, though written by good novelists who capture their own time well. There is no conviction. By worshipping the past you are looking at an ideal of how something existed, because you don't have all the facts and you didn't live in that time. History also tends to be very factual and scholarly, and most people can't appreciate historical works, unless well-educated or into history. You have to understand the allusions and the context of that time - things only educated or interested people would know. But your average intelligent person wouldn't know or care. (Not all intelligent people are history readers). Therefore it is not universal. It comes as strange that the scholar should talk about loving the dead historical figures, and yet hopes for immortality, though the sense of death pervades, almost as if immortality is a vain hope. It is a contradiction, but then Southey may have been speaking as a detached narrator. But it's an interesting insight to how Southey thought. Read about his life, if you can, though his works lack power. But if you like melody, he was considered more melodious than Wordsworth, though the latter more powerful than Southey. Can anybody recommend a book on Southey?